Tyson | Chihuahua in Beckenham. Tyson is a livewire, but a very loving dog who just needs a little patience and training. He hasnt been socialised with strangers so can bark and get a bit upset. Hes super good at following teegans instructions. Shes the alpha. Hes fine off lead in the park because hes really well socialised with other dogs but keep an eye out for runners or bikes. I have 2 bouncy chihuahua rescues. Both 2 years old and Both great with other dogs and love cuddles. 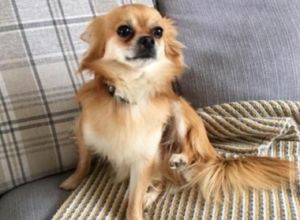 Teegan is a little timid, but tyson hasnt been socialised with strangers at all. So they can both be a bit of a handful, before they get to know you. But truly the most loving dogs if they take to you. Hey, i decided to join the community to find some company for teegan and tyson and hopefully have someone for while im at work, and to give the pups a chance to socialise with more strangers.